I am organizing a panel at the upcoming conference of the American Oriental Society. 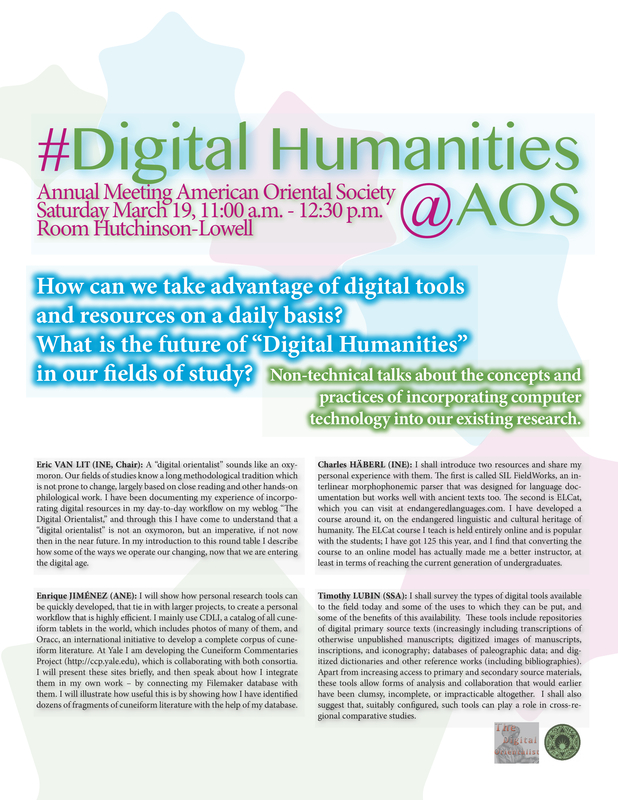 This cross-discipline round table gives an impression of how we can take advantage of digital tools and resources in our day-to-day workflow, and it will further discuss the future role of what is dubbed “Digital Humanities” in each of our fields of studies. Panelists from different disciplines show some of the best practices out there, and explain how they incorporate such resources in their private research practice. The talks have both a conceptual and practical nature, but none are highly technical: the focus lies on how to incorporate technology into our existing research. The round table concludes with a discussion open to all. Eric van Lit (Islamic Near East, Chair): A “digital orientalist” sounds like an oxymoron. Our fields of studies know a long methodological tradition which is not prone to change, largely based on close reading and other hands-on philological work. I have been documenting my experience of incorporating digital resources in my day-to-day workflow on my weblog “The Digital Orientalist,” and through this I have come to understand that a “digital orientalist” is not an oxymoron, but an imperative, if not now then in the near future. In my introduction to this round table I describe how some of the ways we operate our changing, now that we are entering the digital age. Charles Häberl (Islamic Near East): I shall introduce two resources and share my personal experience with them. The first is called SIL FieldWorks, an interlinear morphophonemic parser that was designed for language documentation but works well with ancient texts too. The second is ELCat, which you can visit at endangeredlanguages.com. I have developed a course around it, on the endangered linguistic and cultural heritage of humanity. The ELCat course I teach is held entirely online and is popular with the students; I have got 125 this year, and I find that converting the course to an online model has actually made me a better instructor, at least in terms of reaching the current generation of undergraduates. Enrique Jiménez (Ancient Near East): I will show how personal research tools can be quickly developed, that tie in with larger projects, to create a personal workflow that is highly efficient. I mainly use CDLI, a catalog of all cuneiform tablets in the world, which includes photos of many of them, and Oracc, an international initiative to develop a complete corpus of cuneiform literature. At Yale I am developing the Cuneiform Commentaries Project (http://ccp.yale.edu), which is collaborating with both consortia. I will present these sites briefly, and then speak about how I integrate them in my own work – by connecting my Filemaker database with them. I will illustrate how useful this is by showing how I have identified dozens of fragments of cuneiform literature with the help of my database. Timothy Lubin (South & South-East Asia): I shall survey the types of digital tools available to the field today and some of the uses to which they can be put, and some of the benefits of this availability. These tools include repositories of digital primary source texts (increasingly including transcriptions of otherwise unpublished manuscripts; digitized images of manuscripts, inscriptions, and iconography; databases of paleographic data; and digitized dictionaries and other reference works (including bibliographies). Apart from increasing access to primary and secondary source materials, these tools allow forms of analysis and collaboration that would earlier have been clumsy, incomplete, or impracticable altogether. I shall also suggest that, suitably configured, such tools can play a role in cross-regional comparative studies.